Thy Nativity, O Christ our God, hath shined the light of reason upon the world; for thereby they that worshipped the stars were instructed by a star to worship Thee, the Sun of Righteousness, and to know Thee, the Dayspring from on high. O Lord, glory be to Thee. Archbishop Gabriel, a graduate of Holy Trinity Seminary, served the Hierarchical Vigil and Liturgy for the Feast of the Three Hierarchs. This is the patronal feast day for the seminary. After Liturgy, students, faculty, and alumni celebrated the feast with a reception in the Seminary Hall. For the First Week of Lent, Seminarians join Holy Trinity Monastery for the full cycle of services. On March 7-8, the Russian Church history classes at Holy Trinity Seminary made a trip to the Russian Orthodox Old Rite parish of the Nativity of Christ in Erie, PA. After the visit, the faculty and students went to Niagara Falls. For the second Sunday of Great Lent, the feast of St. Gregory Palamas, Holy Trinity Seminary Choir made a historical first visit to Holy Trinity Cathedral in Toronto, Ontario. The octet came at the invitation of Holy Trinity Cathedral rector and HTOS graduate Archpriest Vladimir Malchenko (1973). On Friday, March 27th, 2015, students of pastoral theology, along with HTOS assistant to the dean Rev. Ephraim Willmarth and instructors Rev. Deacon Andrei Psarev and Dr. Vitaly Permiakov made a three-day visit to the St. John the Baptist parish in Washington D.C. The trip, part of Holy Trinity Seminary’s pastoral theology curriculum, focused on the growth of the seminarians’ pastoral knowledge and exposure to parish life, events, and divine services. On May 24, 2015 Holy Trinity Orthodox Seminary had its 67th Commencement and marked the end of the 2014-15 academic year and the conclusion to the years of seminary studies for the Graduating Class of 2015. 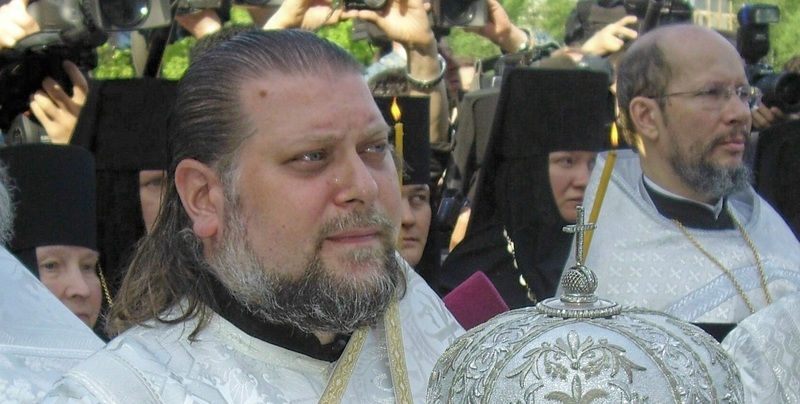 Metropolitan Jonah (OCA) presided at the hierarchical vigil and liturgy. In the summer of 2015, Holy Trinity Orthodox Seminary Professor Deacon Andrei Psarev led an excursion to Istanbul with members of his Byzantine History Class. 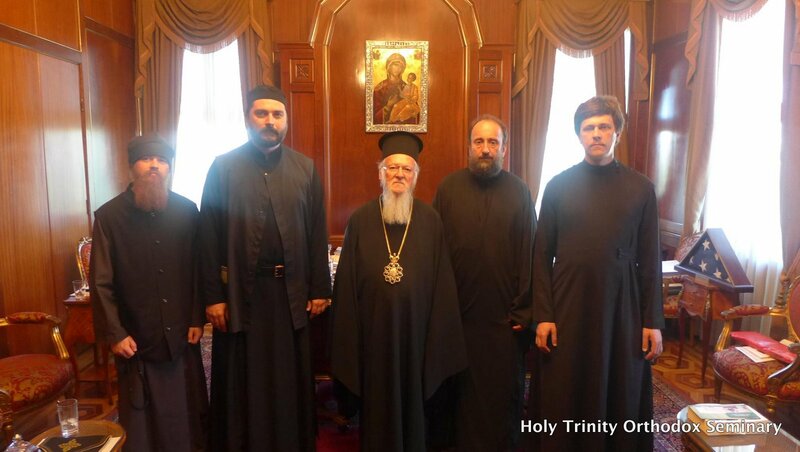 From July 14 to 21, 2015, two instructors from Holy Trinity Orthodox Seminary in Jordanville, Rev. Deacon Andrei Psarev and Dr Vitaly Permiakov, and two second-year students, Hegumen Constantin (Churchin) and Novice Angelos Stanway visited historical sites in Istanbul (Constantinople) and Iznik (Nicaea). On July 18, the group from Jordanville paid a visit to the seat of the Ecumenical Patriarchate in the Phanar district of Istanbul. Выпускники Свято-Троицкой семинарии несут свое служение в разных условиях и качествах. Мы главным образом знаем о тех, кто служит в епископском и пресвитерском сане. Меньше о диаконах и совсем ничего знаем о тех кто не принял священный сан. К этой категории относятся те, кто трудится на приходах, в тюрьмах и просто на светских работах. Записанная по Скайпу беседа с Константином Сегргеевичем Ноговицыным (выпускником 2007 г.) должна послужить началу восполнения этого пробела. Holy Trinity Seminary graduates carry out their ministry in a variety of places and capacities. The ones we know about the most tend to be our graduates in the episcopal and priestly ranks; we know less about the deacons and hardly anything at all about those who have remained as laymen. These include both parish and prison workers and men in ordinary civil employment. This Skype interview with Constantine Sergeevich Nogovitsyn, our 2007 graduate should begin to redress this imbalance. New and returning seminarians and faculty were greeted with a brand new welcome sign officially ushering in the new school year. On Thursday, September 17, 2015, Rector Archimandrite Luke (Murianka) gave his opening talk to the seminarians. He spoke about the importance of improving oneself spiritually and intellectually while at the seminary and throughout life. Following the talk, the seminary had its annual opening BBQ with the seminarians and faculty behind the dorm. n appeal was made to Holy Trinity Monastery to assist with refurbishing the roof on the church in Ladomirova, Slovakia, where many of the monastics of our monastery resided before the advance of the Soviet Army. A donation was sent, and the reply was an invitation from His Beatitude Rastislav of the Czech Lands and Slovakia, to Archimandrite Luke to take part in their celebration of the feast of the Beheading of St. John the Baptist. A large portion of the Holy Head is enshrined at the church. Father Luke arrived on the eve of the feast day itself and attended the services there, the celebration being transferred to the nearest Sunday. Immediately after the Liturgy, Father Luke began his extensive tour of all the local parish communities. On Wednesday, September 23, 2015, The Right Reverend Bishop John (Abdalah) of Worcester and New England (Antiochian Archdiocese) visited Holy Trinity Orthodox Seminary to give a lecture entitled “Pastoral Care in a Complex Time” for seminarians and faculty. Bishop John has both theological and psychological education, with a Master of Divinity and a doctorate in counseling. From October 10-15, 2015, HTOS professor Deacon Andrei Psarev took part in the twenty-second Congress of the Society for the Law of the Eastern Churches, held in Thessaloniki. The SLEC academic forum was established in 1971 at the University of Vienna to study the canon law of both Orthodox churches and those allied with Rome. On behalf of Archimandrite Luke (Murianka), the faculty, staff, and all at Holy Trinity Orthodox Seminary, many of whom knew Fr. Deacon Nikolai personally, we would like to express our deepest sympathies to the Triantafillidis family and greater Russian Orthodox community of San Francisco and the Western American Diocese for the passing of the beloved and memorable Protodeacon Nikolai. May his memory be eternal! Mr. Roman Shliakhtin delivered this presentation entitled "Representations of the Byzantine Empire in the Russian Popular Culture and the Problems of the Historical Perception in the Twenty-First century" on October 8, 2015 to the Byzantine History students. Other members of faculty and administration also attended. Mr. Shliakhtin is a Junior Dumbarton Oaks Fellow (a Harvard-affiliated institute in Washington, D.C.). Holy Trinity Orthodox Seminary is pleased to have been given the privilege of hosting Mr. Shliakhtin's first presentation here in the United States. Mr. Shliakhtin showed how Byzantine History has been used in public media in Russia and abroad, and gave perspective on the historical accuracy of those presentations. Mr. Shliakhtin's work underscored the value of Byzantine History in contemporary times, that the enormous contribution of the longest-running empire in history is still relevant today, and a proper understanding of it is valuable in many ways. Students of Holy Trinity Orthodox Seminary study Byzantine History in preparation for Church History studies, in order to understand the basic historical framework and context of major Church events, such as the Ecumenical Councils. From October 9 to 10, 2015, Holy Trinity Orthodox Seminary held its second annual academic symposium, entitled “Saint Tikhon, Patriarch of Moscow (1865-1925): His Life and Times.” The Symposium was dedicated to the Saint’s “double” anniversary this year: 150 years since his birth, and 90 years since his blessed repose. On Wednesday, November 18 at 5:00pm Holy Trinity Orthodox Seminary presented a lecture by our abbot and rector, Archimandrite Luke (Murianka) titled "Material, The Soul, Relics, and the Transfer of the Remains of Bishop Konstantin From Texas to Jordanville." В среду, 18 ноября, в 17 часов, в Свято-Троицкой Духовной Семинарии состоился лекция наша настоятелья и ректора Архимандрита Луки о Епискорпе Константине.